Wife 22 [Book Review] – my books. my life. When she receives an invitation to take part in a marriage study, Alice Buckle, a former playwright who feels disconnected from her husband after 20 years of marriage, jumps at the chance to tell her stories. She is given the label Wife 22 and assigned to Researcher 101. But the relationship between Wife 22 and Researcher 101 quickly deepens, causing Alice to reflect on and question her choices in life. I wasn’t too sure what to expect going into Wife 22 and found I was pleasantly surprised. Gideon plays with different ways of storytelling – through facebook statuses, google searches, and scenes of dialogue as if Alice’s life were a play. This unconventional storytelling added something to the book and kept it from becoming just another story of a woman lost in her roles as wife and mother. I felt for Alice and really enjoyed watching her history reveal itself through the questionnaire. Alice’s answers are given without the questions (they’re provided in the back but flipping is way too much work on an ebook) and it was fun to try to figure out what her prompt was. 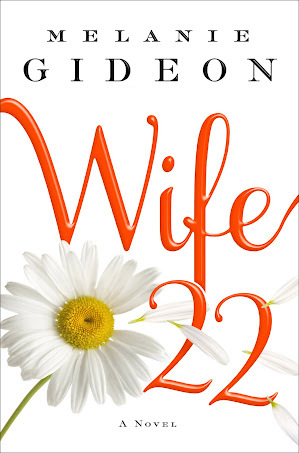 Wife 22 is charming, funny, and honest (and it reads very quickly if you’re looking for a book to get lost in for a few hours). I definitely recommend this one. Have been hearing this book mentioned everywhere. Glad you think the alternative narrative style worked. Thanks for the review, will check it out some time soon. I have been seeing this book everywhere. I will have to get a copy for myself.